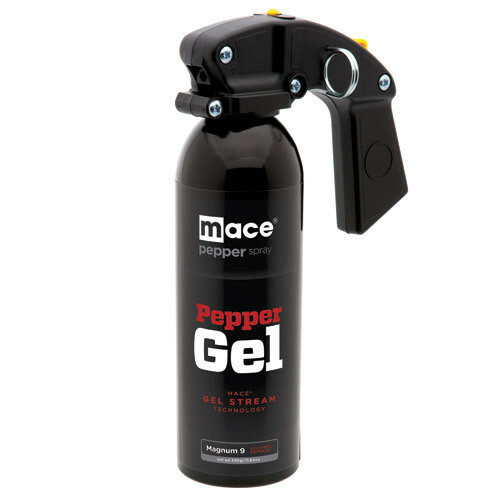 Mace Pepper Gel Distance Defense Sprays combine the Maximum Strength Formula of OC Pepper and invisible UV marking dye with the added sticking power of Mace Gel Stream Technology. This Ultimate Pepper Gel Formula outperforms conventional pepper sprays by delivering extreme stopping power that blindfolds an attacker with reduced blow back from wind. Mace Pepper Gel is offered in three sizes for delivering a targeted stream of Ultimate Pepper Gel Formula up to 25 feet! 10% OC Pepper, invisible UV marking dye that can help police identify your assailant, and Gel Stream Technology that sticks for prolonged immobilization of attackers. Just spray and get away!